In April, 2001 I took a two week trip to China. My purpose was to learn about debating in China, encourage more debating, to select students to attend the World Debate Institute, and to learn as much about education in China as well as anything else I could learn. This journal is a personal recollection of events, and is not designed for any specific audience, not for just friends, or just colleagues, or just those interested in debating, but for anyone who is interested in reading it. I apologize for its length, but it was a trip full of detail, new images, and new thoughts. Spelling of Chinese names is approximate at best. Pictures were taken by the author and reflect amateur photographic ability using a Sony digital camera which saves images as .jpegs. I have always been extremely interested in China. As a young boy I read many books and stories from China and I was always interested in movies related to China, although I learned early on that they tended to be very slanted towards a western view of China. I had majored in Asian Civilization in college at Brown University even though I never learned an Asian language. As a debate coach I have followed events in China for thirty years because it relates directly to any international issues we debate. Little did I know that my love for China and my love for debate would come together and they have -- they have come together in this trip. I met Juefei Wang because we work in the same building at the University of Vermont. He teaches in the Asian Studies program, and both programs moved into this old Tudor home about four years ago. We noticed each other, it seems, because of our work habits. We both worked very long hours and somewhat odd hours, and we began to joke with one another about it. We would find ourselves in the building on Sunday mornings and late on weekday evenings. He noticed the debaters frequenting the office so often and I noticed the high quality students he was attracting, even people who stopped debating to study Chinese language and culture with him. He saw the influx of people from around the world every summer for the World Debate Institute and I saw his trips and exchanges with China and other parts of Asia. One Christmas morning we found ourselves in the office working, and we began to appreciate each other's work. We started a conversation about our work, and he learned about my international debating activities and I learned about his China programs. We began to see a possible cooperation, and about 18 months ago he started to make contacts for me in China about possible debate exchanges. There seemed to be some real interest in China, and we began pursuing the possibility for Chinese students and teachers to visit the World Debate Institute. It became clear, though, that such a possibility needed more than an invitation, but a proactive attempt on my part to build bridges. This is how my current trip came about. Juefei invited me to join him on a trip to China with some New England educators. 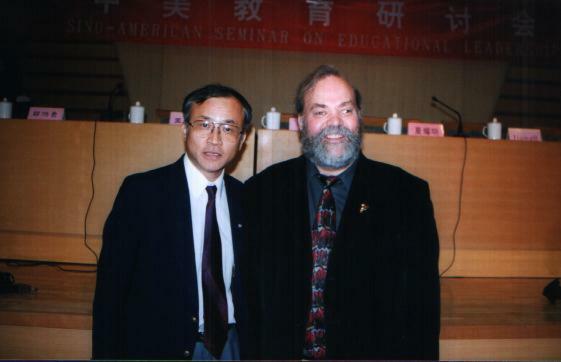 We would be attending the Sino-American Seminar in Educational Leadership in Qufu where I would make a presentation about debating as an educational method, and I would be able to visit with Chinese educational institutions sending students to the World Debate Institute and work with them. I also knew from my previous international efforts that networking and planting a seed can produce incredible results given time and effort. Juefei helped me locate funding for my trip and supported my efforts with letters and lobbying. He assisted with visa arrangements and orientation, and would be accompanying me on the trip. So, this two-week trip became a reality. I am part of a group of 13 educators who are travelling together, and our itinerary involves attending the Sino-American Seminar on Educational Leadership in Qufu, side trips away from the group for me to network with schools interested in debating, as well as functions in Beijing and a bit of sightseeing as well. I also hope to meet up with a former debater of mine who is teaching English in Beijing. The weeks leading up to our departure were very difficult. Being gone for two weeks during the middle of the semester presented a challenge to make sure that the students in the one class I am teaching (Presidential Campaign Rhetoric) would be well cared for, as well as administrative matters relating to the World Debate Institute, my work with Urban Debate Leagues, and many other matters. The time was so full that I didn't really have chance to get very excited about the trip until I started to pack. Then it hit me, that three of the next four weeks of my life would be spent abroad, two weeks in China, one week back in America (during which I would attend a two day Urban Debate League conference in Atlanta, and then one week in Chile attending the Hispanic Language debate championship of the Americas I had been invited to. That's what happens when you dream dreams, some of them begin to come true.